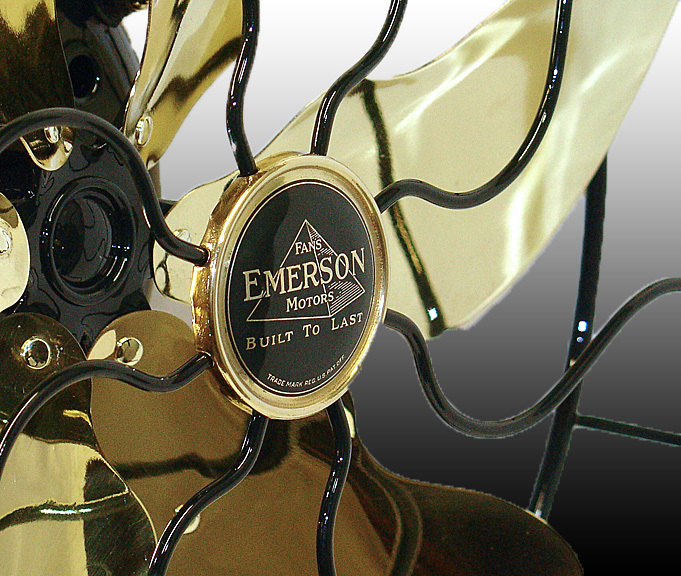 "BUILT TO LAST" was the Emerson logo, and last they did. This original Emerson model 71666 was manufactured between 1923 and 1932 and it is still running strong today - over 80 years later. 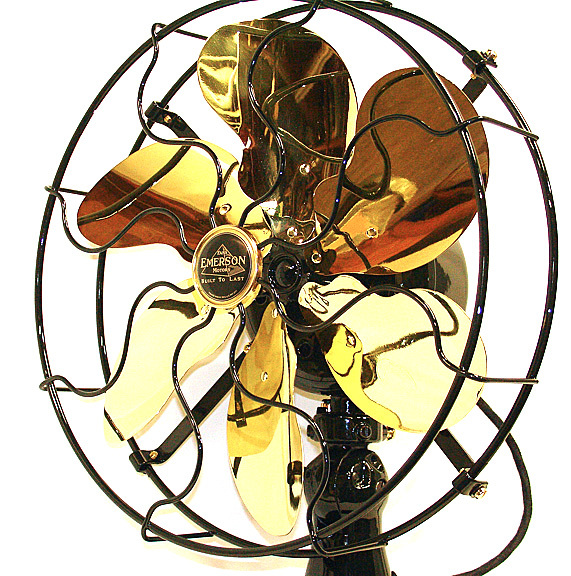 The Emerson model 71666 was designed as a residential fan. 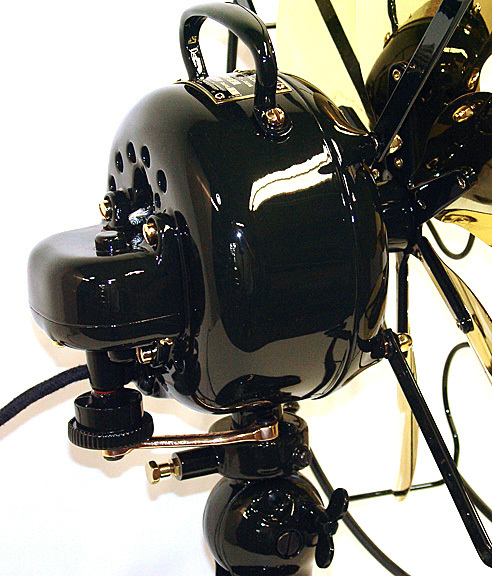 It ran at slower speeds, provided more air movement, and featured 6 brass blades being turned by an improved efficiency, more powerful 6 pole motor. 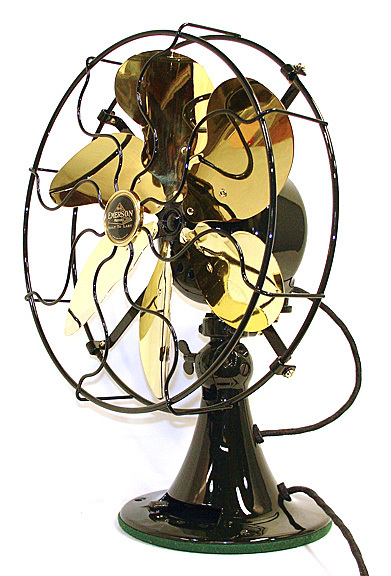 This fan features 12 inch diameter Parker (unique to Emerson), solid brass blades, adjustable oscillator, and 3 speeds. 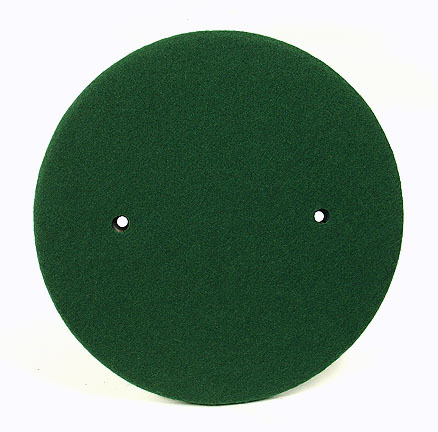 The blades are removed from the hub and they are processed separately. 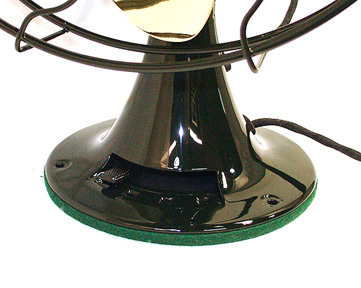 After refinishing, they are reassembled using solid brass rivets and special tooling. 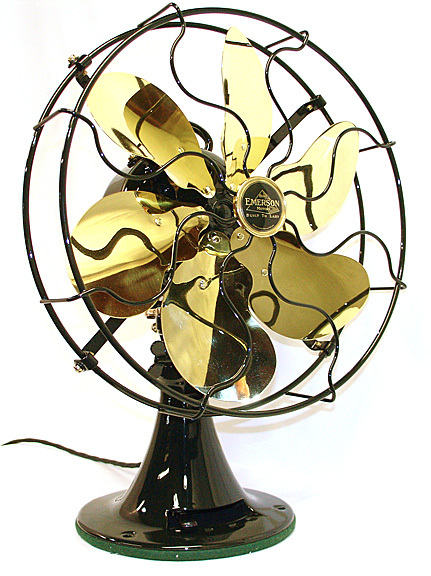 The six, solid brass "Parker" blades have been roll-formed and matched to improve air flow. They are then stroboscope aligned and dynamically balanced to provide very smooth operation. Finally the blades are machine buffed and clear coated. These precision blade adjustments are another special step in this restoration. 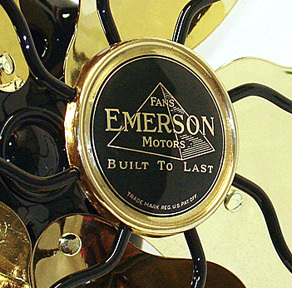 Beautiful brass cage badge features the Emerson Pyramid design and "BUILT TO LAST" logo. This is an especially difficult badge to restore and they are seldom seen in this condition. Background has been restored, embossed brass polished, then an overall clear coat applied for preservation. Speed control has been completely rebuilt to include complete rewinding of the choke coils. This makes the motor more compatible with todays higher line voltages and allows the fan to operate more like it was intended to. 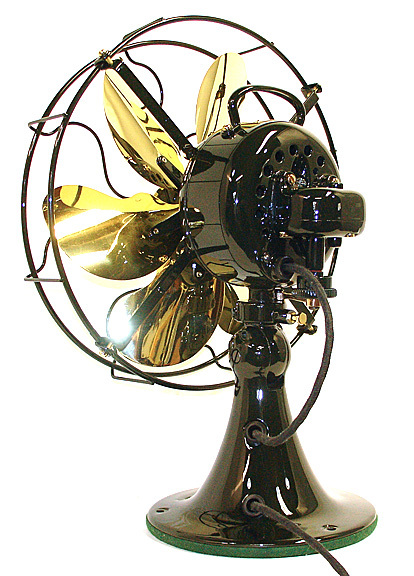 Powerful 6-pole motor smoothly turns these large blades with ease. It runs strong and smooth while only using 38 watts on the LOW setting. Very nice distinctive speed changes at 750 RPM on LOW, 950 RPM on MEDIUM, and 1100 RPM on HIGH. 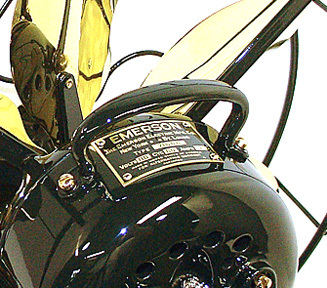 Beautiful solid brass Emerson motor badge provides the specs for this model. Badge background has been restored, raised brass polished, then clear coated for preservation. Only polished, solid brass rivets are used to anchor the badge. Fixed shipping cost of $45.00 is for FedEx Ground in the continental U.S. only. If FedEx Ground is not available in your area or another carrier is desired, please email for shipping costs. Packaging is done with new materials and cartons. 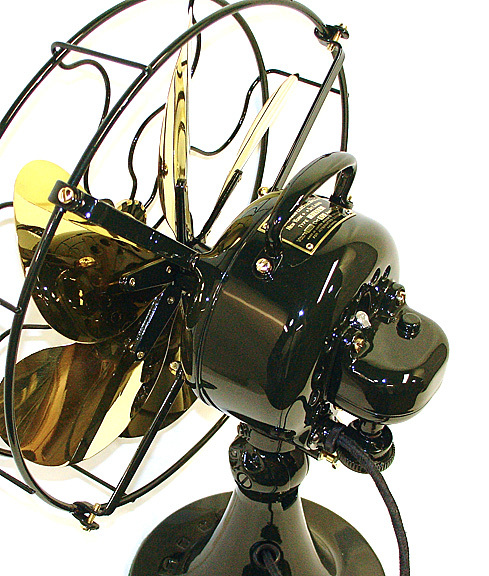 INTERNATIONAL BIDDERS SPECIAL NOTE: You are welcomed, but be aware that this fan motor operates on 110-120 VAC at 60 cycles. 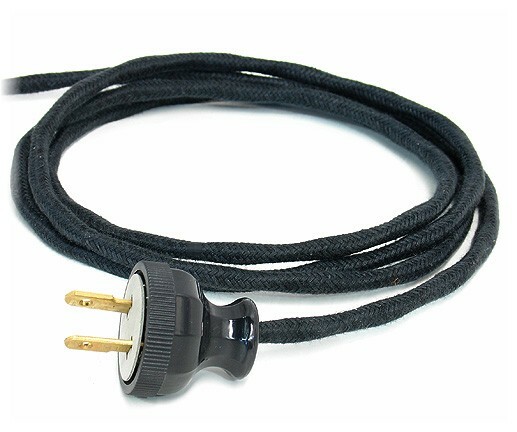 You WILL need special electrical adapters for use in your country. Also, because ebay does not have a system for calculating freight charges for single shipments with multiple cartons, the required entry of international shipping charges is erroneous. Please email before bidding for shipping costs and insurance limitations for your country. 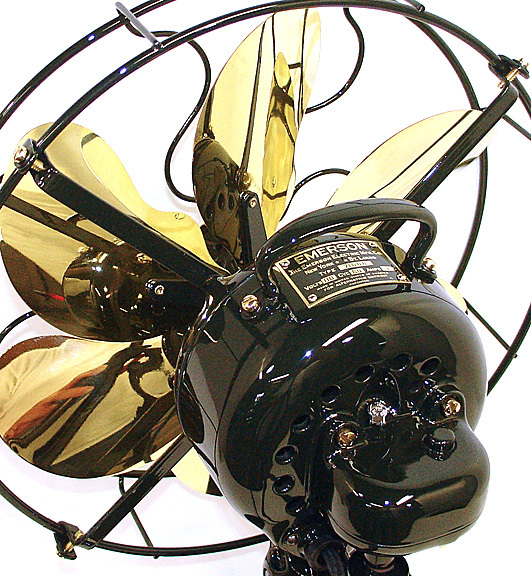 This restored Emerson 71666 electric fan comes with a written 12 month electrical warranty on the motor and speed control.